The Wooster men’s and women’s golf teams have had very successful 2013 fall seasons. The men ended their season with their best tournament finish to date. They placed third out of 11 teams at the DePauw Small College Classic and also had two players in the top 10, T.J. Selby ’15 in fifth and Marcus Carano ’16 in eighth. Both Players were selected to be on the All-Tournament Team. The women have also achieved good results during the fall season, establishing new team records for the lowest score through both 18 and 36 holes and also finishing second out of 12 teams at Wittenberg University’s Pat Clouse Invitational at the Springfield Country Club, which is the highest finish for the team at a tournament. The success that the men’s golf team has had thus far is due to the addition of a number of talented first-years and strong returning leadership on the team, provided by players like Selby, Carano and Calvin Milligan ’16. This team has more talent and potential compared with last year’s, but the members are also very young and will need some time to adjust, which will have its challenges and advantages as the team moves into their winter season. “We all have played well in our own respect in the fall but we are still working on putting it all together on the same day,” said Carano. 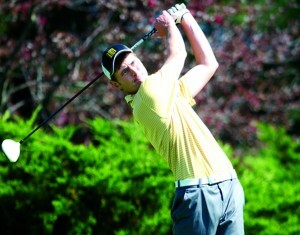 With the upcoming end of the fall season, the Wooster men’s golf team is looking forward to their winter sessions. According to captain Selby, the team will lift weights, strengthen the mental psychology of the team and individuals and even do a little bit of yoga to keep a close and balanced set of golfers. The team placed fourth in conference last year and is hoping to move up a few spots during spring season. Both Carano and Selby have a lot of faith in the young team to earn a spot in the top three. Good results have extended to the women’s golf team as well with a solid ending to the fall season. Team depth, competitiveness and a strong first-year class were all contributing factors to the women’s success. “We are constantly pushing each other during practice to instill competitiveness,” said Sharmeen Chinoy ’16. This mentality has definitely paid off; the team earned their best score, a 334, in the history of the program. In addition, almost every individual has scored her personal best during the fall season. During the winter, they are hoping to work hard to improve on their physical strength, fitness and swings. One goal for the women this 2014 spring season is to play well and rank in the top four in conference. Chinoy also shared her eagerness and faith in the team by adding that they hope to beat their best 334 score. With hard work and commitment during the winter, both the men and the women are looking toward a strong spring season. Both teams have talent and a lot of momentum from the fall season.